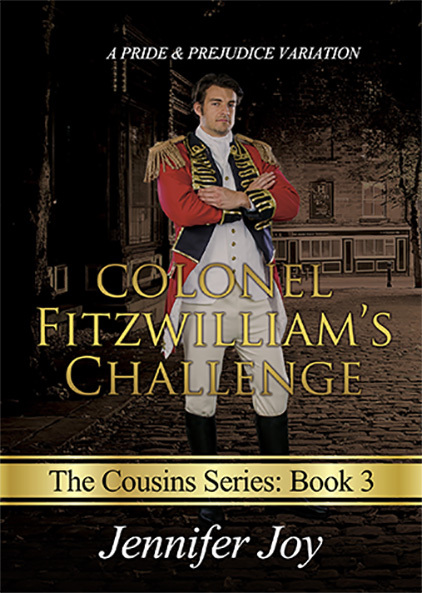 Last month Jennifer Joy released Colonel Fitzwilliam’s Challenge, her latest book and last of The Cousin Series. If you’ve read my reviews of Darcy’s Ultimatum and Earning Darcy’s Trust, I’m sure you will know by now that I love Jennifer’s writing, so the release of this new book was the perfect opportunity for me to propose a small interview to her. Jennifer Joy didn’t launch any blog tour for the release of the book, so I wasn’t sure she was going to accept it, but I was lucky and honoured that not only she accepted to be interviewed by me, but also suggested doing a giveaway of Colonel Fitzwilliam’s Challenge. So, it was with great joy that I received her at From Pemberley to Milton to answer a few of my questions, and it is also with great joy that today I will bring happy news to 2 lucky winners. But before announcing them, I would like to thank all who participated, shared and supported this initiative. I also want to give Jennifer Joy a huge thank you for being such a wonderful writer, such a nice person, and for the generosity to offer 2 copies of her latest book to the readers of From Pemberley to Milton. Congrats and happy reading Deborah and Christina! Congratulations ladies! And thank you, Rita, for inviting me and making this giveaway possible! I’m thrilled!! Thank you for the ebook–can’t wait to read over the break! Thank you so very, very much Joy! I am so excited!